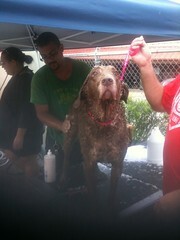 Live De Life Living in the USVI's: Kimber getting a bath for a good cause. Kimber getting a bath for a good cause., originally uploaded by captainjay. The humane society is having a fund raiser at the dog house bar in Havensight. $25 for a nail clip shampoo and massage. Dogs only.